Sir Cyril Taylor has been at the heart of English education for over two decades, serving as an adviser to ten successive UK Education Secretaries and Four Prime Ministers, both Conservative and Labour, including Margaret Thatcher and Tony Blair. His passion for education has led directly to real school improvement, from the creation of City Technology Colleges to specialist schools and academies, which together now constitute over nine in ten secondary schools in England. The Specialist Schools and Academies Trust, the body he founded, is now a leading force in school improvement worldwide. A Good School for Every Child draws on that wealth of experience. While offering an insider's look at some of the key challenges in education, it is also an invaluable guide for parents and teachers interested in how our schools work today. There is a particular focus on how to raise standards in low attaining schools, improving levels of literacy and numeracy and teaching our children the skills they need for the 21st Century. This book is also a clarion call to our political leaders about the challenges that still remain: the education of children in care, the failure to stretch able youngsters and the problems recruiting enough good science teachers. Education is more open today than ever before, with league tables and inspection reports. Yet for many outsiders, it can seem a world clouded by its own language and rituals. 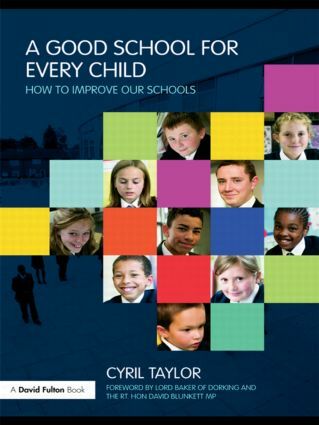 Cyril Taylor opens the door to that world, through stories of inspirational headteachers and successful schools. By doing so he offers a vision that is both instructive and inspirational, one that shows how schools working with parents and the wider community can raise the standards of achievement for all their pupils. Are academies a good thing? How can we better integrate our ethnic minorities into their communities? Are schools with a religious character a good thing? Who will champion our vulnerable children? What lessons can we learn from other countries which have high standards in their schools? Could British educational reforms be introduced into the United States?